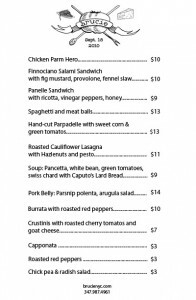 Brucie, the new Italian restaurant-market on Court Street, is finally open and in spite of my early hesitation at the name, the menu looks worthy of a few tries. That, and the fact that while I loitered outside peeking in this morning not only did a local walk by and tell me the food is terrific but the people inside waved and a guy, who turned out to be the chef-owner’s boyfriend, came out and chatted enthusiastically about the new business. 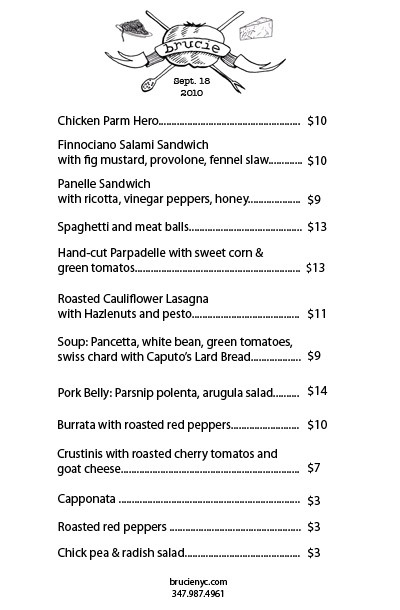 I’m loving the sound of the panelle sandwich with ricotta, vinegar peppers and honey for $9, the Finnociano Salami sandwich with fig mustard, provolone and fennel slaw at $10 and the roasted cauliflower lasagna with hazelnuts and pesto at $11. As is the rampant trend, produce and meats are locally sourced and the menu changes according to daily availability. Whatever is cooking, for example chicken parmigiana, will also be available to take home from the mini market set-up. The restaurant opened ominously last week during the now-infamous Brooklyn tornado touchdown. But in good spirits, the guy I chatted to today figured that was a good omen. 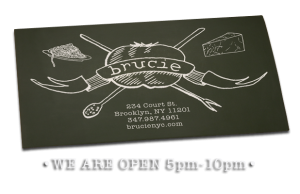 I already like the cheerful buzz of Brucie and will be trying it soon! The hours for now are Tuesday to Sunday 5pm to 10pm but once they are up and running, I’m told there are plans to open all day, including brunch. Brucie replaces the defunct sushi joint Cube 63 at 234 Court Street, near the corner of Kane Street. 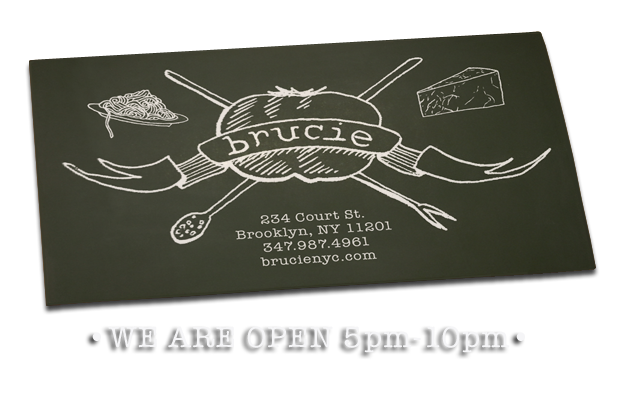 Here’s an example of the menu posted on the website at www.brucienyc.com.